Hiya guys! We are officially into December now so it's time to start rolling out the holiday manis and nail art. Just like last year I'll be joining in the Challenge Your Nail Art's 12 Days of Christmas prompts. It was one of my favorite challenges last year so I have been looking forward to it ever since. 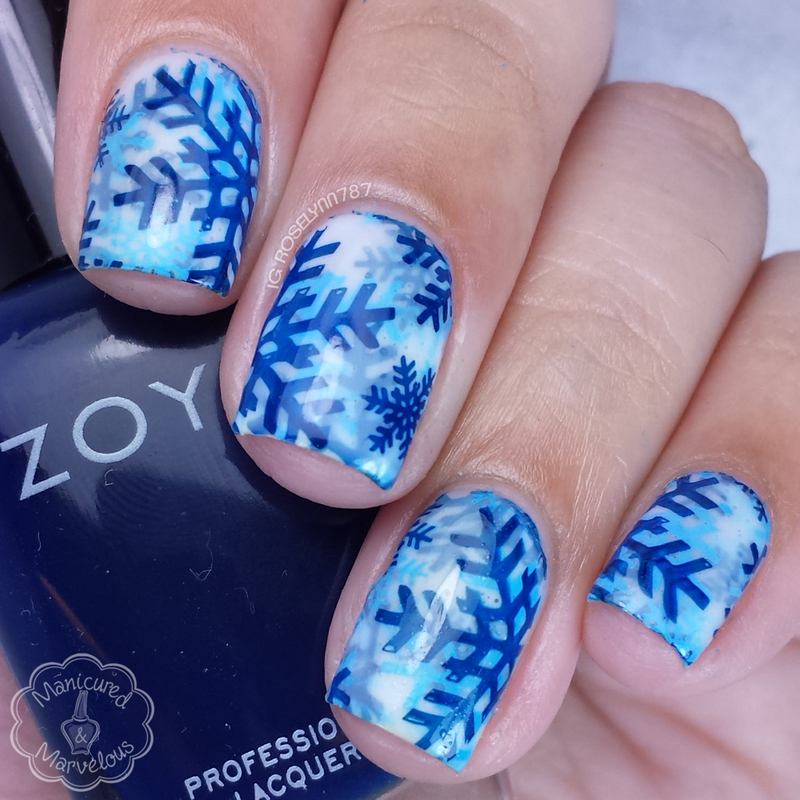 To kick the month off, the first nail art prompt is 'Snow Day' and here's what I ended up coming up with. I'm beyond excited with how these ended up turning out. Don't they look like nail wraps? 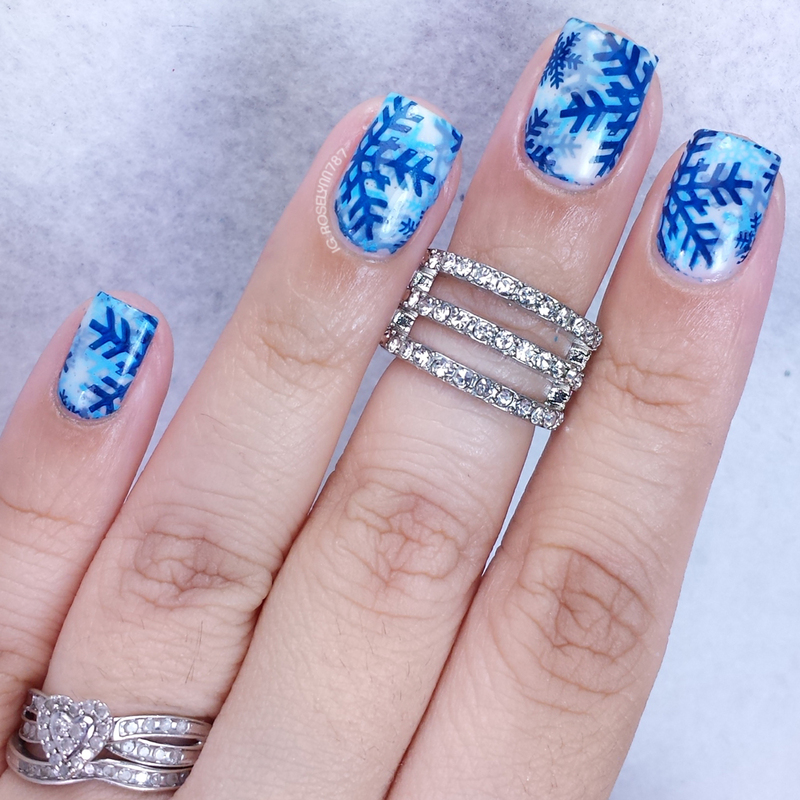 This mani definitely makes me wish it was snowing in Jersey already. Here's hoping we'll get some by the time Christmas is here! The first thing I needed to get in order to achieve the design I wanted, aka the pond technique, was a sheer white polish. I didn't have one. But luckily making a sheer polish is super easy and shouldn't cost you more than a few bucks at your local drugstore. I purchased Sally Hansen's Xtreme line clear polish Invisible and their white polish from the same line called White Out. I used exactly ten drops of White Out into the clear polish to give me the desired opaqueness. And there is a video! Please don't forget to give me a thumbs up and subscribe! The idea behind a pond technique is all about layering, almost like making a sandwich. The key is having a sheer polish, which you could make or a popular choice are the sheer tints from OPI. Another vital thing is having patience because this does need a lot of drying time in between layers, especially if you're stamping. This mani took me about three episodes of Orange Is The New Black, haha. That's about two to three hours although to be fair you have to account for recording time. 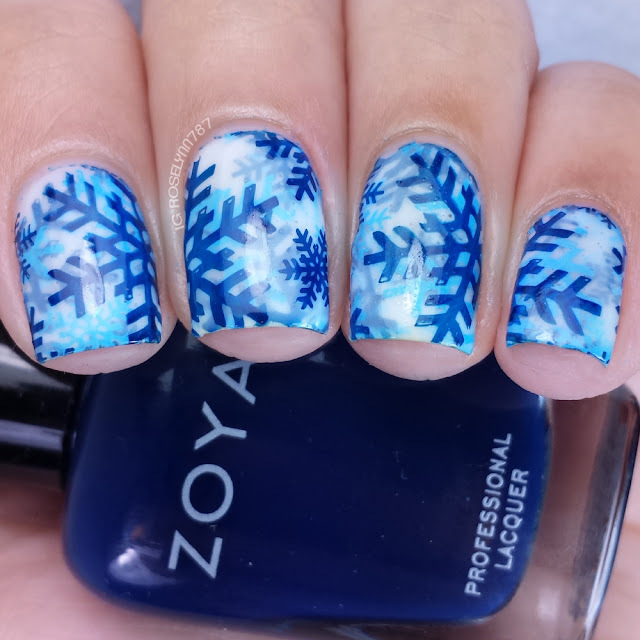 I was initially torn on how to do the snowflakes, but stamping was definitely the best choice. I really hope you guys enjoyed this mani as much as I do. Let me know if you have any questions and be sure to tag me @roselynn787 if you decide to recreate this look. Don't forget to check out the other ladies participating in the month long Challenge Your Nail Art prompts. And if you're looking for something fun to do this month, then consider joining in yourself! Thanks for reading guys. this came out absolutely gorgeous Rose!!! We used the same stamping image for our prompts today haha sista brains! Wow, I really like these!! It looks so awesome. This is a stunning manicure! Your pond manis are always awesome! <3 I so badly want to try a pond mani! I need to do something like this over the weekend! Hi just stopped by your youtube channel to comment on your great video but I don't think you respond there. Have u tried cici & sisi xmas plate? I just ordered it but I don't have the moyou one. Hopefully the one I ordered will do. Great job. I subbed on your youtube as well. I wish I had pretty nails so I could decorate them! These are so cute! I love this snowflake design and background affects! Sweet Baby Jesus this is perfection! I need to pick upo some extra clear polishes for making sheer polish. Yes yes yes yes yes. This is amazing!!!! This is fabulous!! I love the effect! The depth in this look is incredible. They do look like wraps! Or magic. Double stamping for snowflakes looks like such a great idea! I love your look! These came out like layered snow peeeerrrrrfection! Omg I love this!! Absolutely fantastic. Love this look!! Even with the "pond" you can see each snowflake...they really look like wraps!